Kelly is an early member of the Cville TimeBank and currently a member of the Kitchen Cabinet (Board) of CTB. She enjoys the community building and social opportunities that the TimeBank brings, not to mention getting help with tasks outside of her skill set. Here in Charlottesville, the Daily Progress ran an article about the Cville TimeBank's one year birthday. These are more than just "feel-good fluff" stories: members are getting things done, saving money, and building community -- one transaction at a time. 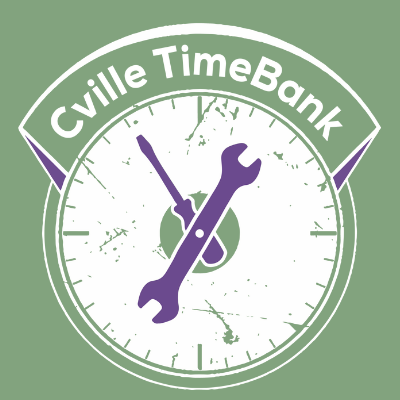 Cville Timebank helps locals get something for nothing. Cville TimeBank Auction Item: Homemade Bread for a Month! I will make you a fresh loaf of bread every week for a month (4 loaves) delivered to a Cville city location or pickup downtown. These will be made out of fresh ground whole grains that still have all approx 26 of the nutrients available for your nourishment -- these nutrients start to oxidize and … Continue reading Cville TimeBank Auction Item: Homemade Bread for a Month! Cville TimeBank Auction Item: Gingerbread Elf! I think I have molasses in my DNA. I learned how to make gingerbread houses from my mother when I was a kid, and over the last 30 years, I've made over one hundred houses for my family, for gifts and for sale at craft shows. I will provide all the ingredients and equipment to … Continue reading Cville TimeBank Auction Item: Gingerbread Elf! Cville TimeBank Auction Item: Learn to make earrings! One-on-one tutorial to make a pair of beautiful sterling silver dangle earrings (for pierced ears) using my extensive stash of artisan glass and silver beads -- your choice, your design! Come with an outfit in mind to accessorize, or just see how my stash might inspire you. Plan on about two hours, start to finish. … Continue reading Cville TimeBank Auction Item: Learn to make earrings!